Schedule the time to train and help make it part of your athlete’s lifestyle: Make training a part of the day. Like brushing your teeth, it is something that is done each day. It may seem challenging with a sports schedule and school, but the sooner it can become a habit, you will see the benefits in other areas of your child’s life. The consistency and discipline can spill over to school and overall work ethic. Once this habit is formed, it is tough to break, but one must prioritize forming it. Get started: Procrastination kills good intentions. Skipping or missing workouts can snowball. These things will slow progress and exhaust motivation. Keep a workout log: This will allow tangible progress to be seen easily and ensure things are moving in the right direction. Do not chase perfection: People tend to hesitate doing things that they do not do well out of the gate. Obviously, strength training should be done with effort and sound programming, but take improvement over perfection. Check the box: Your athlete (and all of us) will not always feel like training. Remember that half a workout is better than no workout. Live to fight another day. Set realistic goals: Don’t out-kick your coverage. Set goals that can be achieved and enjoy the success of achieving it. Then recalibrate and aim higher. Put in effort: This should be implied. Work hard and concentrate on what you are trying to accomplish. It takes hard work, there are no shortcuts. The sooner you can realize that, the sooner you will be inclined to put the work in and reap the benefits. Don’t obsess over your diet: Keep it simple. For high school athletes, focus on eating a variety of whole real food. Optimal nutrition is critical to perform at their best. Do not lose sight of where want to be: Help your athlete look forward to where they want to be and, as specifically as they can, write it down. Distractions and setbacks are part of the deal. Looking forward and having specific long term goals will make the inevitable hang ups along the way seem minor. 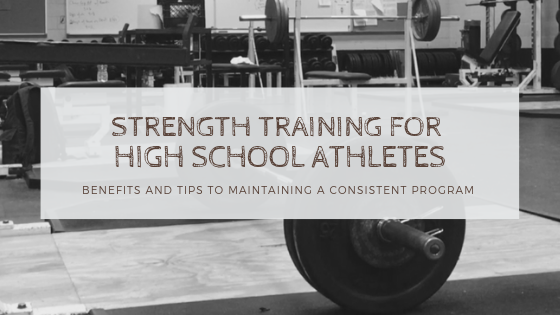 Our student-athlete strength training program is designed to compliment your athlete’s competitive sport schedule to help maximize the benefits in a short period of time. Click below to schedule a time to come in and see what we can offer your serious athlete.